Line 8-inch square pan with waxed paper, leaving 1-inch wax paper above edges; set aside. In large saucepan, bring milk, rum and lime peel to a boil. Turn off heat and let flavors infuse for 5 to 10 minutes. Transfer mixture to prepared pan. Cover with plastic wrap and puncture in several places to let steam escape. Let cool, then refrigerate for 3 to 4 hours or overnight, until firm. Remove plastic wrap. Lift custard onto cutting board. Cut into 1 1/2-inch squares, removing wax paper, if necessary. Preheat oil in Presto® electric deep fryer. Beat eggs and water in shallow bowl. Place bread, cookie and cracker crumbs in another shallow bowl. Line another baking sheet with waxed paper. Place custard square first in egg mixture to cover evenly, then into crumbs. Pat to adhere crumbs. Transfer to baking sheet lined with waxed paper. 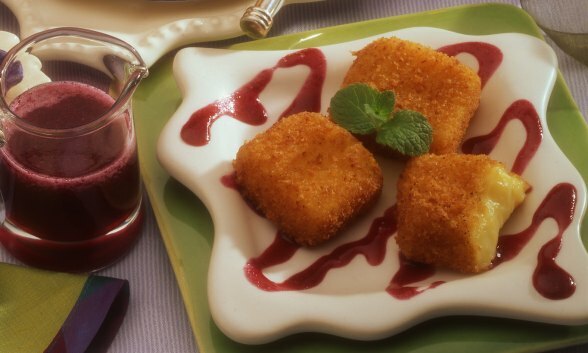 Fry squares in hot oil in small batches. Do not crowd fryer. Fry until golden, about 35 seconds. Transfer to paper towel lined baking tray. Serve immediately with chilled blueberry sauce. Increase lime to peel of 1 lime. In microwave-safe bowl, melt 6 ounces finely chopped white chocolate on HIGH for 1 minute. Stir until smooth. Heat an additional 10 seconds at a time, if not melted. Add white chocolate to finished pastry mixture while still hot. Stir until smooth and transfer to prepared pan. Puree berries and strain. In very clean medium saucepan, combine sugar, water, lime juice and cinnamon. Cook over medium-low heat until sugar dissolves. Increase heat to high and cook until mixture turns a golden caramel color. (Do not stir after you increase the heat.) Remove saucepan from heat and stir in a few spoonfuls of the puree. Be careful, the caramel will bubble vigorously.Let bubbling subside, then add a few more spoonfuls. Carefully add remaining puree. Refrigerate. Sauce can be made a day ahead.